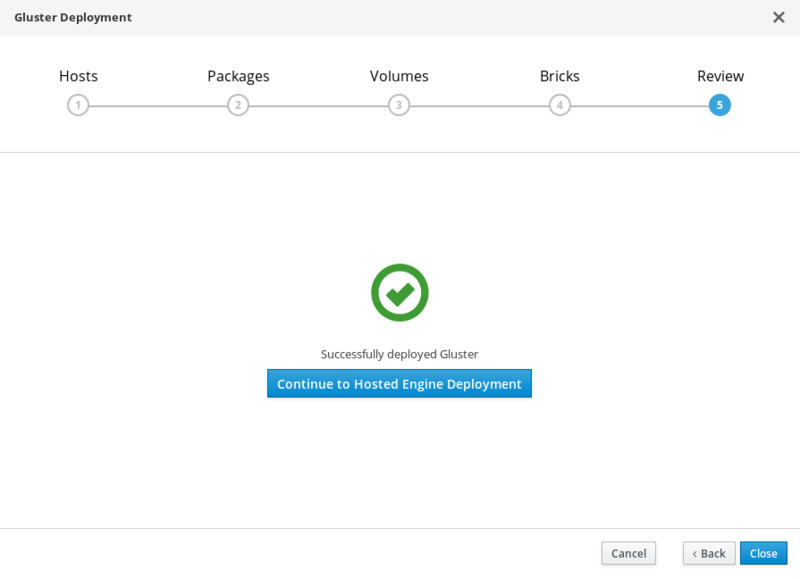 This document outlines how to deploy Red Hat Hyperconverged Infrastructure (RHHI) across three physical machines, using Red Hat Gluster Storage 3.3.1 and Red Hat Virtualization 4.1.8. This creates a discrete cluster for use in remote office branch office (ROBO) environments, where a remote office synchronizes data to a central data center on a regular basis, but can remain fully functional if connectivity to the central data center is lost. Red Hat Hyperconverged Infrastructure (RHHI) combines compute, storage, networking, and management capabilities in one deployment. 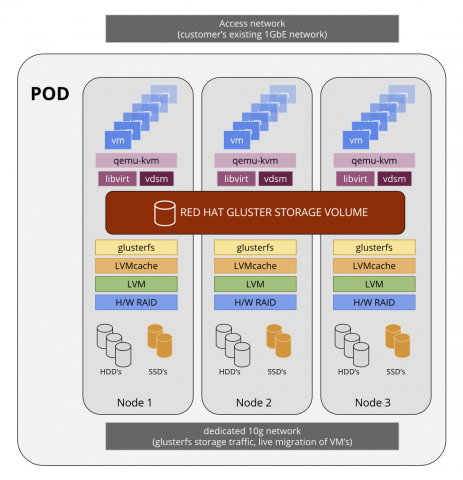 RHHI is deployed across three physical machines to create a discrete cluster or pod using Red Hat Gluster Storage 3.3.1 and Red Hat Virtualization 4.1.8. From the first virtualization host, configure Public Key authentication based SSH for the root user to all three virtualization hosts. Ensure that you use the hostnames or IP addresses associated with the back-end management network. 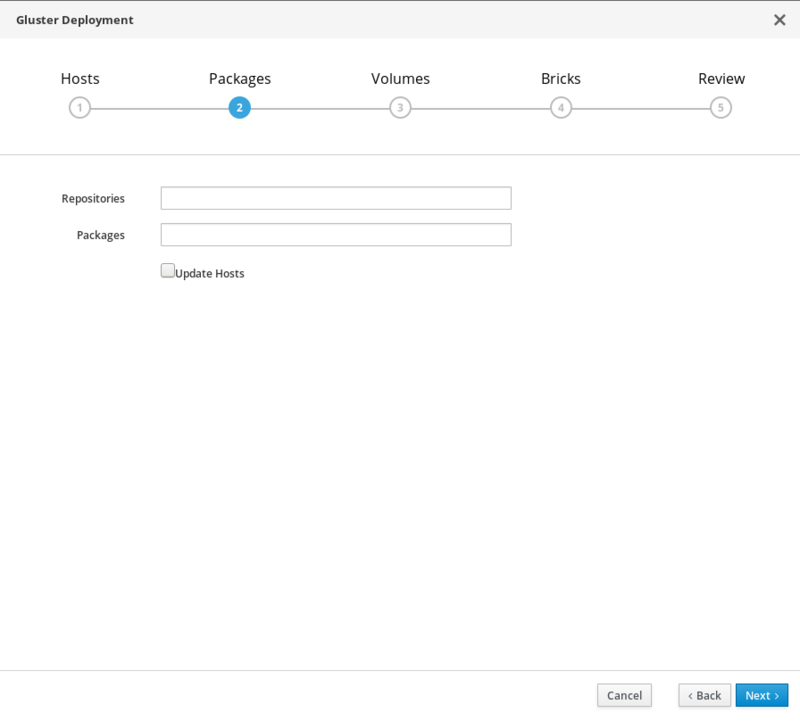 Depending on your requirements, you may want to perform some additional configuration on your newly deployed Red Hat Hyperconverged Infrastructure. This section contains suggested next steps for additional configuration. Details on these processes are available in Maintaining Red Hat Hyperconverged Infrastructure. If your main storage devices are not Solid State Disks (SSDs), Red Hat recommends configuring a logical volume cache (lvmcache) to achieve the required performance for Red Hat Hyperconverged Infrastructure deployments. 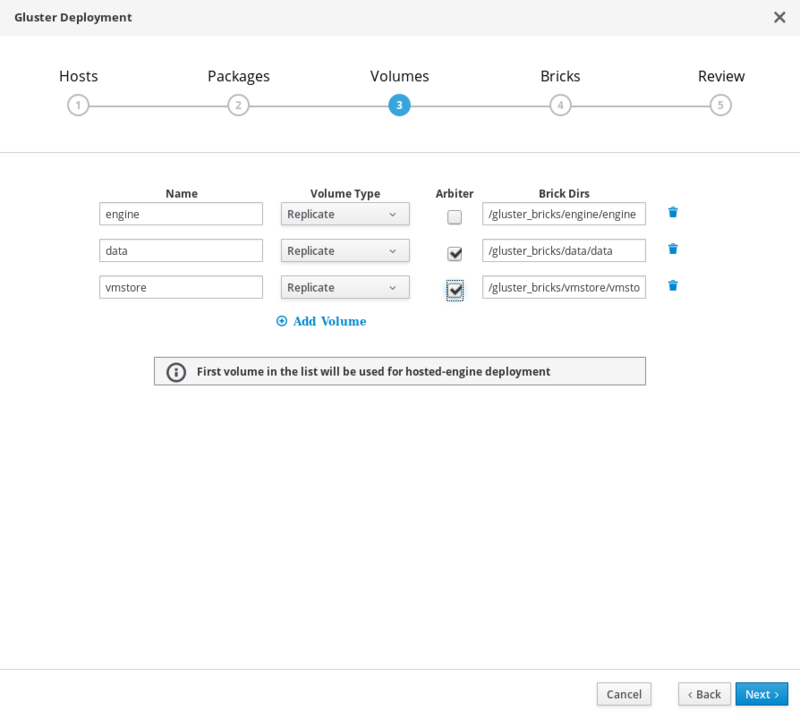 Geo-replication is used to synchronize data from one Red Hat Gluster Storage cluster to another. 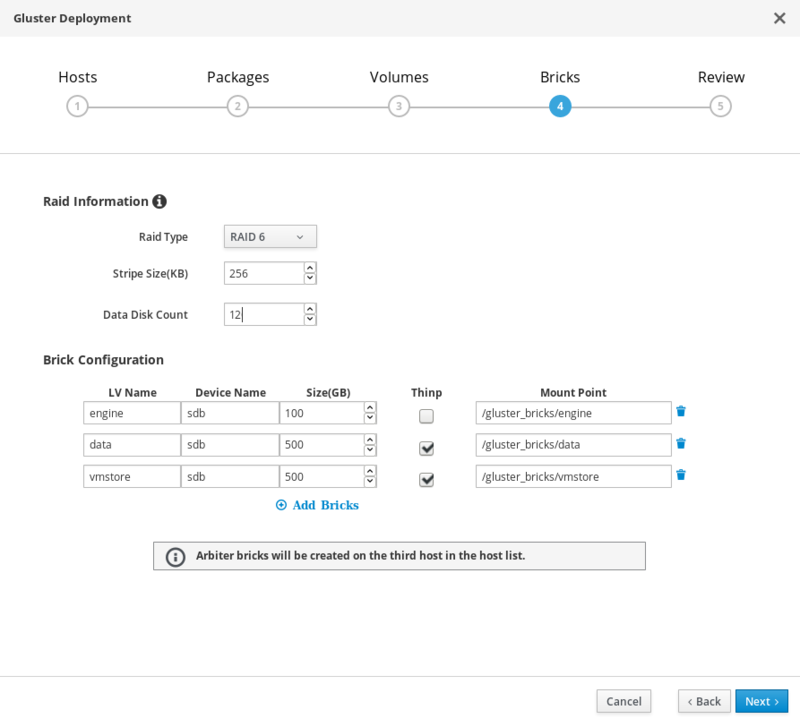 Synchronizing the local data volume from your discrete Red Hat Hyperconverged Infrastructure (RHHI) cluster to a central data center on a regular basis helps ensure you can restore your cluster to a working state after an outage. 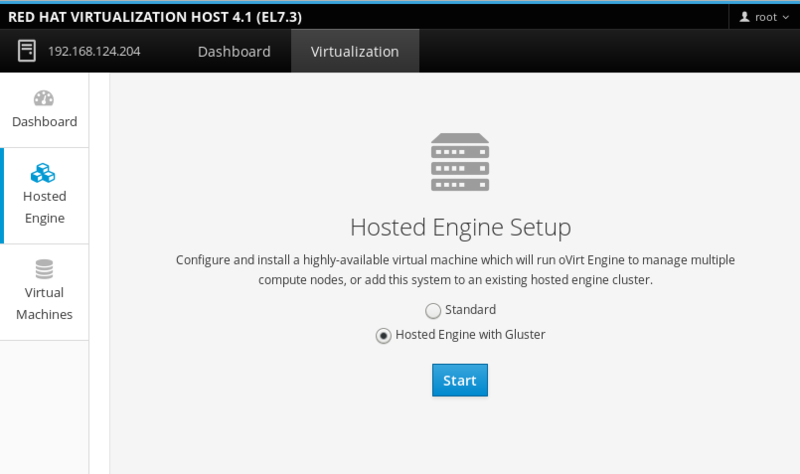 See Configuring geo-replication for disaster recovery for details. The log file for the Cockpit based deployment process (documented in Chapter 7, Configure Red Hat Gluster Storage for Hosted Engine using the Cockpit UI) is stored in the ~/.gdeploy/logs/gdeploy.log file, where ~ is the home directory of the administrative user logged in to the Cockpit UI. If you log in to the Cockpit UI as root, the log file is stored as /root/.gdeploy/logs/gdeploy.log. The log files for the Hosted Engine setup portion of the deployment process (documented in Chapter 8, Deploy the Hosted Engine using the Cockpit UI) are stored in the /var/log/ovirt-hosted-engine-setup directory, with file names of the form ovirt-hosted-engine-setup-<date>.log. Error details are then listed in red. Contact Red Hat Support with the details of your error for assistance in correcting it. 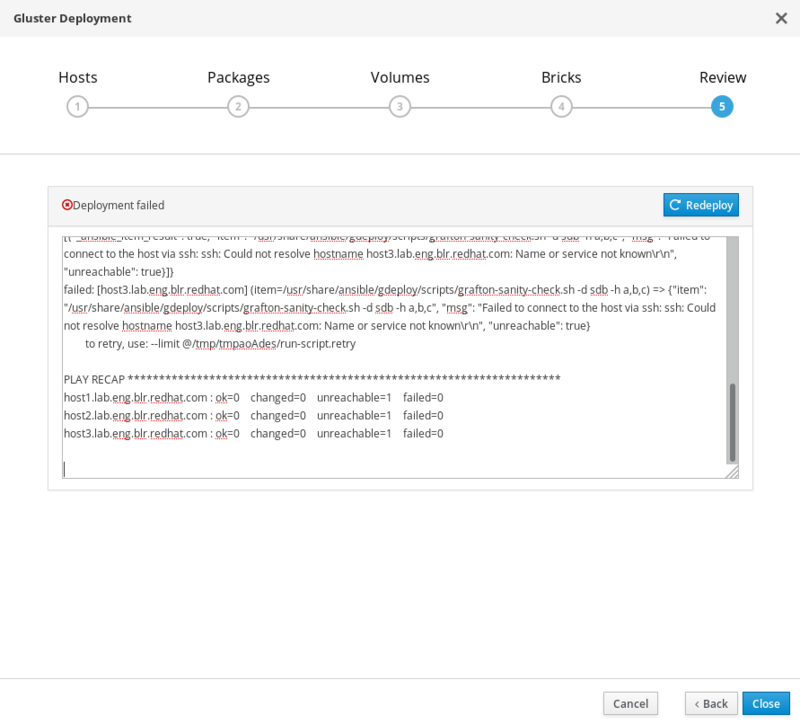 Add the following lines to each volume listed in the configuration file generated as part of Chapter 7, Configure Red Hat Gluster Storage for Hosted Engine using the Cockpit UI. This creates and configures TLS/SSL based encryption between gluster volumes using CA-signed certificates as part of the deployment process. 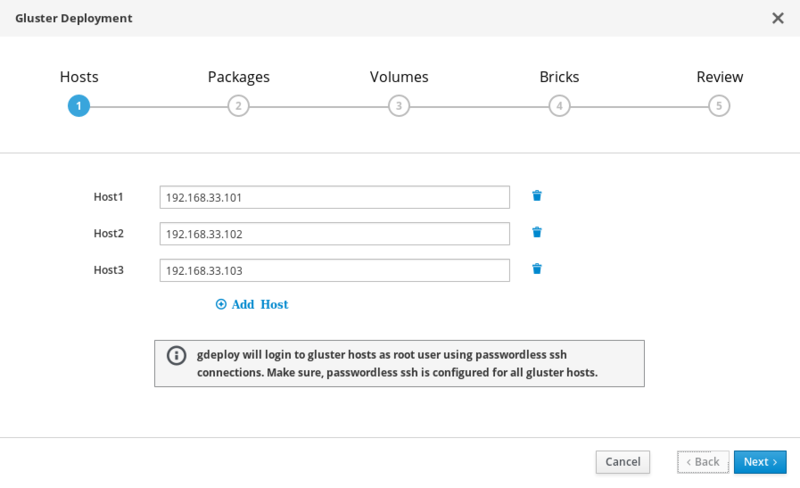 Add the following lines to the configuration file generated in Chapter 7, Configure Red Hat Gluster Storage for Hosted Engine using the Cockpit UI to create and configure TLS/SSL based encryption between gluster volumes using self signed certificates as part of the deployment process. Certificates generated by gdeploy are valid for one year. 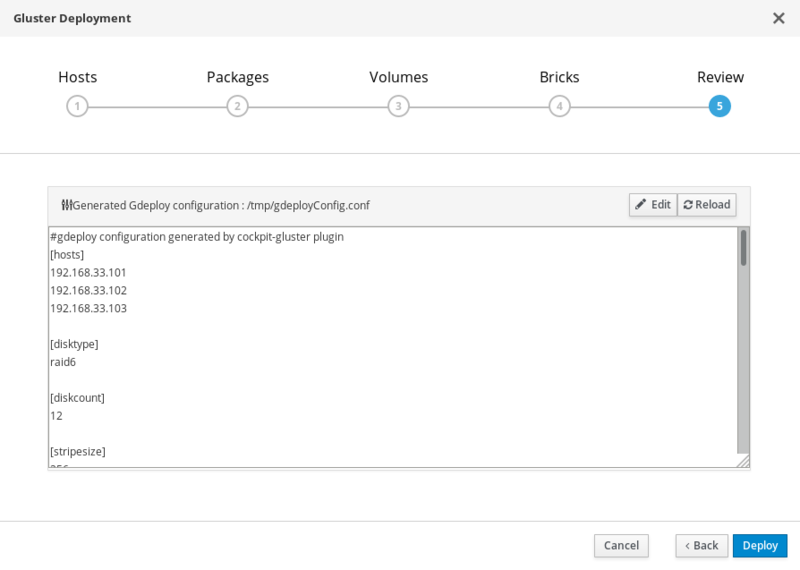 The Cockpit UI provides provides a wizard that allows users to generate a gdeploy configuration file that is suitable for performing the base-level deployment of Red Hat Hyperconverged Infrastructure. No additional packages or repositories. For further details on any of the sections defined here, see the Red Hat Gluster Storage Administration Guide: https://access.redhat.com/documentation/en-us/red_hat_gluster_storage/3.3/html/administration_guide/chap-red_hat_storage_volumes#chap-Red_Hat_Storage_Volumes-gdeploy_configfile.